From Denmark, Rams Farm sells a variety of goat cheese and meats with samples available. They have been breeding champion Nubian dairy goats for more than 20 years. The cheddar and feta cheeses are delicious. Visit Helen's site at www.ramsfarm.com and their phone number is 207-452-2772. Cynthia Flores from the Middle Intervale Farm in Bethel brings vegetables, pork, beef and flowers. She had a a basket full of fiddleheads. Although this spring delicacy is pretty strange looking, I have heard that it is delicious. Never having had the courage to try it, I would love to hear just how you would cook it. Heck, I love brocoli-rabe so fiddleheads might be good. To find out more, please visit www.middleintervalefarmstand.com and www.vegetablesdance.com. 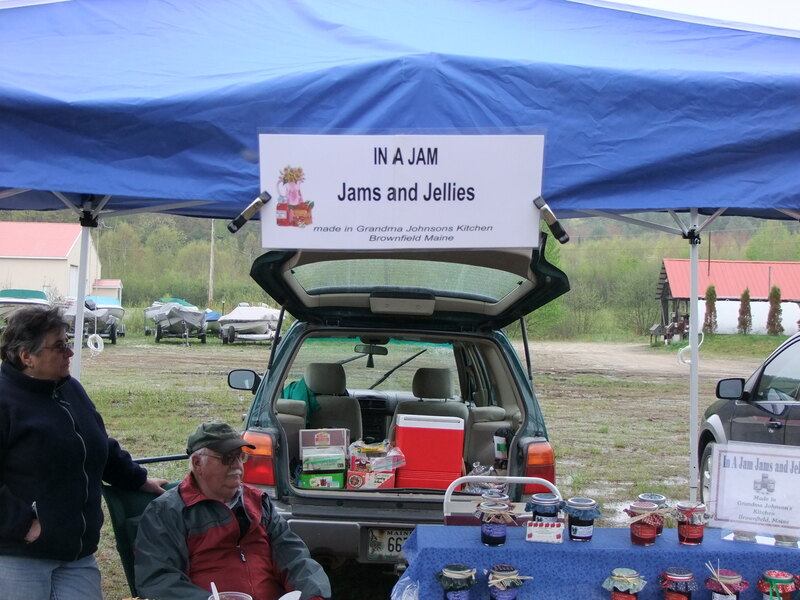 Grandma Johnson from Brownfield brought her homemade jams and jellies. I purchased a jar of homemade mustard and used it on my sandwich for lunch--very good! Her store is called IN A JAM. Grandma can be reached at 207-935-3909. Having fresh fruit, veggies, meat and flowers available every week is a wonderful addition for Lovell. Located at the Wicked Good Store, the market is open every Wednesday from 9-1. The word from the vendors is that they are doing very well here. Be sure to support them! Fantastic! We'll definitely be stopping by next week! Looking forward to seeing everyone. Jean, when are you arriving in Lovell? Farmers Market is a plus for Lovell, I think. Good of you to promote it. Stan, there is no mystery to cooking fiddleheads. Most folks steam them, but this spring a friend served them to me fried up in a little butter, which was great. too. They are quite fragile, so you have to pay attention. Give them a try. May need to have a full bottle of wine with me!